Comprising a series of specially commissioned chapters by leading scholars, this comprehensive volume presents an up-to-date survey of the central themes in the philosophy of mind. It leads the reader through a broad range of topics, including Artificial Intelligence, Consciousness, Dualism, Emotions, Folk Psychology, Free Will, Individualism, Personal Identity and The Mind-Body Problem. 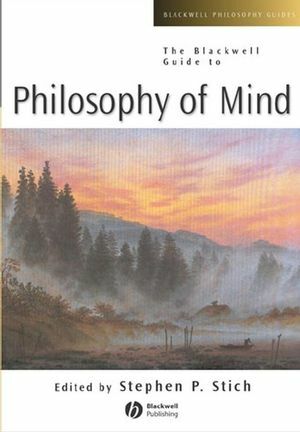 Provides a state of the art overview of philosophy of mind. Contains 16 newly-commissioned articles, all of which are written by internationally distinguished scholars. Each chapter reviews a central issue, examines the current state of the discipline with respect to the topic, and discusses possible futures of the field. Stephen P. Stich is Professor of Philosophy at Rutgers University, where his current research interests are in Philosophy of Mind and Cognitive Science. His publications include From Folk Psychology to Cognitive Science (1983), The Fragmentation of Reason: Preface to a Pragmatic Theory of Cognitive Evaluation (1990) and Deconstructing the Mind (1996). He has written articles in the area of Philosophy of Mind, Cognitive Science, Philosophy of Language, and Epistemology. Ted A. Warfield is Associate Professor of Philosophy at the University of Notre Dame, where his current research interests are in Philosophy of Mind, Epistemology, and Metaphysics. His publications include Mental Representation: A Reader (1994; co-edited with Stephen Stich) and Skepticism (co-edited with K. DeRose). He has written articles on Determinism, Moral Responsibility, Human Freedom, and Knowledge. 1. Mind/Body Problem I: Kirk Ludwig. 2. Mind/Body Problem II: William Lycan. 6. Mental Representation: Fred Adams. 7. Cognitive Architecture: Ken Aizawa. 8. Concepts: Eric Margolis and Stephen Laurence. 9. Mental Causation: John Heil. 10. Folk Psychology: Stephen P. Stich and Shaun Nichols. 13. Artificial Intelligence: Andy Clark. 14. Philosophy of Mind and the Sciences: John Bickle. 15. Personal Identity: Eric Olson. 16. Free Will: Randolph Clarke.